The value of dielectric constant are the most important parameters in material science technology. In micro-wave and millimeter wave circuits using dielectric materials the values of this parameters should be known accurately. It is observed that the number of methods are reported in litrature, however these methods impose difficulties in experimentation and are not very accurate. 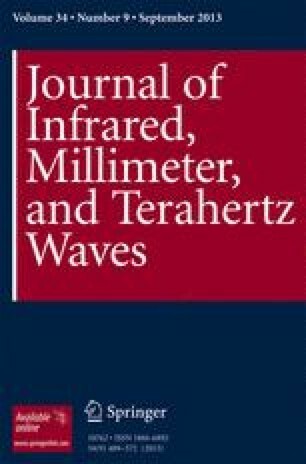 In this paper a novel approach to the measurement of the dielectric constant of low loss materials at micro-wave and millimeter wave frequencies has been discussed. In this method by using antenna theory, a metallic strip dielectric guide is taken in to constideration and band reject phenomenon of dielectric antenna is used. Frequency response of an antenna in band reject mode is a function of the dimensional parameters, such as the metallic strip period, the profile of the metallic strip and the dielectric constant of the material used. Hence if one measure the frequency responce of the antenna in band reject mode, the dielectric constant of the material is determined provided all other parameters are known. This method gives a direct measure of dielectric constant and is quite accurate as computer techniques are used for evaluating the dielectric constant. This method verified experimentally also.